The Aerial Robotics Lab at the Imperial College London has created a flying 3D printer to remove harmful materials and objects, such as nuclear waste. 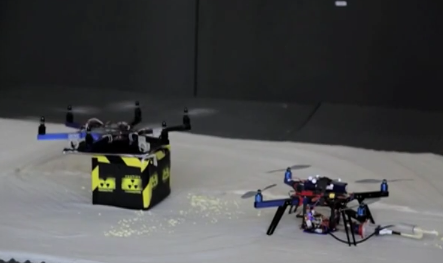 The flying 3D printer, called the quadcopter, prints a sticky form onto the dangerous object. A second robot, using GPS, approaches the object, and lands on the sticky material. A few minutes later, the sticky chemical hardens, and the second robot flies off, carrying the object with it. The robots can be used to remove radioactive waste or fix damaged buildings. The drones can travel to hard-to-reach places and safely remove dangerous items. The quadcopter was inspired by how swiftlet birds build nests using their own saliva. The researchers at the Aerial Robotics lab were led by Mirko Kovac, Adam Braithwaite and Graham Hunt. The drone uses two chemicals that when combined, creates polyurethane, a foam polymer. The robots use a printing module to extrude the chemical foam. The second robot runs on a regular battery and can carry at least 2.5 kilograms (5.5 pounds). Scaled-up versions could potentially carry up to 40 kilograms (88 pounds). The drones could also be equipped with a fuel cell to recharge batteries with solar cells. “In particular, extending the scope of scientific survey robots in challenging environments such as rainforests through the adaptable construction of recharging platforms or monitoring stations,” said Thomas Creedy, an ecologist at the Natural History Museum in London who is working with Kovac. Kovac showcased his drones at the Imperial Festival in London on May 9th and 10th.